McMaster is committed to the advancement of global health and well-being. We have led the way in solving complex health issues both at home and abroad through innovative education and policy development. Learn how we’re helping create a Brighter World for all. 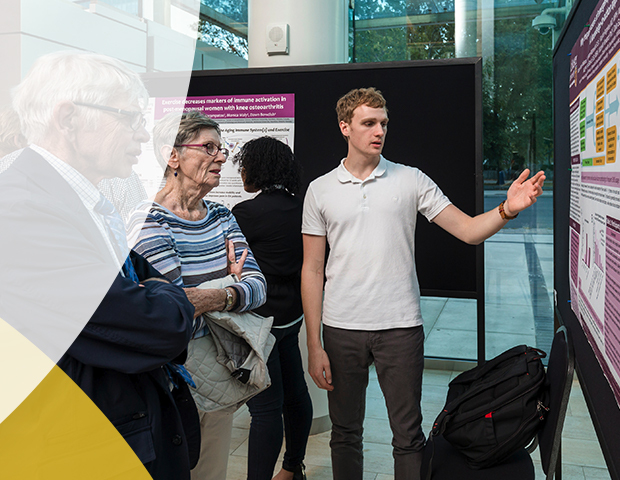 Students in McMaster’s health and society PhD program are working to change the world, one practical solution at a time. You may think you have an allergy to penicillin, but you probably don’t. Two McMaster physicians have five facts about penicillin allergy published today in the Canadian Medical Association Journal. The World Health Organization and its regional office for the Americas – the Pan-American Health Organization – have renewed the McMaster health Forum's designation as the PAHO/WHO Collaborating Centre for Evidence-Informed Policy for another four-year term. McMaster to expand the scope of its Social Systems Evidence site in order to support the United Nations' Sustainable Development Goals. The McMaster Health Forum and 13 international partners have received a $2 million grant to help policymakers meet the UN's Sustainable Development Goals. Nikhil Pai, assistant professor in McMaster University's Department of Pediatrics and a McMaster alumnus, has won an Innovation Fund Award for a research project focused on helping children with Ulcerative Colitis. McMaster PhD student Jason Au is spending the summer in Japan taking part in a unique fellowship that allows him to work on a project with Japanese researchers, while providing him with opportunities to explore and experience Japanese culture. Dr. Santerre's key innovation was to add ingredients during manufacturing of plastic medical devices the body won't reject. Her research examines the level of access to supplementary health insurance coverage among Canadians and key characteristics associated with having, or lacking, coverage. A renowned breast cancer researcher and Chair of Oncology at the Michael G. DeGroote School of Medicine has been inducted into the Order of Canada. McMaster's Juliet Daniel was honoured with a Harry Jerome Award from the Black Business and Professional Association this weekend. A panel of cannabis use researchers says Canadians need to start preparing for the legalization of marijuana. The group, which included reporters from Japan, Germany, Austria, Hungary, Switzerland, Israel, France and other countries, met researchers and learned about the Institute’s work in human stem cell reprogramming and drug discovery. Malcolm Sears, a professor of medicine at McMaster and world-renowned for his influential research on asthma, has received the 2016 J. Allyn Taylor International Prize in Medicine. McMaster, along with The Ottawa Hospital, the Children’s Hospital of Eastern Ontario and the University of Ottawa have congratulated Turnstone Biologics Inc.3 on securing $41.4 million U.S. in new private investments. A McMaster researcher studying how to embed mental health policy into Canada's social system has been named a 2016 Pierre Elliot Trudeau Foundation Doctoral Scholar.